Edward H. Murfee earned Bachelor of Arts and Master of Arts degrees from the University of Alabama and was a member of the Alabama Corps of Cadets when it was mustered into Confederate service during the Civil War. Doctor of Law degrees were later conferred on him by Bethel College and Wake Forest College. He was elected a member of the American Society for the Advancement of Science and offered a scholarship in the London Society of Science. At age 22, Murfee taught school in Alabama. At 26, he was awarded the chair of military engineering at the University of Alabama, then filled the chair of English at the University of Tennessee and then organized the Mississippi Military Institute. 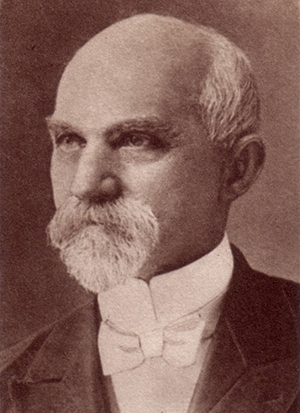 Murfee came to the University of Arkansas in 1885 as chair of mathematics and logic, in which he served two years before being appointed acting president and then confirmed as the university’s fifth president a year later. Attendance at the university rose to about 700 students during his administration. He guided the university on a sensible and steady course despite a lack of sufficient money from the state, which caused frequent faculty changes, and in the face of limitations imposed by the state legislature affecting student labor. The first men’s residence hall, a laboratory for physics and chemistry, the Agricultural Experiment Stations and oversight of the Arkansas Law School at Little Rock came during his administration. After leaving the university, he taught at Alabama Central College and Brenau College in Gainesville, Ga. Personal: Murfee was born to James Wilson and Margaret Parker Murfee at Murfee’s Depot, Va., in 1845. He married Odella Oter Manning, and they had six children. He died in Gainesville in 1932.